Entering Tone opens a space where shifting meanings are embedded in a sound. This is our organisation’s second visit to Taiwan. Our first, in 2016, was a vastly informative research trip. In that trip, through meeting artists, musicians, curators and organisers in Taipei, Tainan and Taichung, we learned much – and also learned how little we knew. 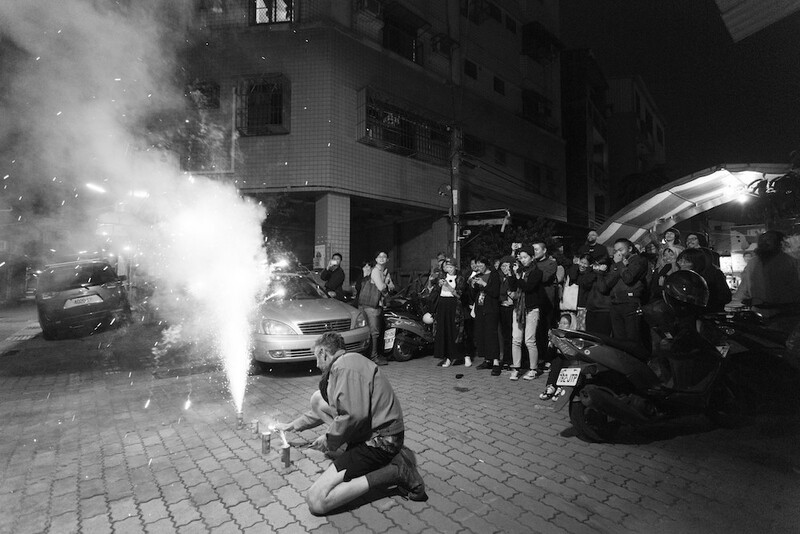 In 2017, we attempt to apply an open, experimental methodology to the practice of international touring – establishing deeper collaborations between our 5 artists and our Taiwanese colleagues; extending and embedding our engagement locally with pedagogy as well as affect; rejecting the distinction between thinking and making; and generating formal and informal opportunities for interventions in social space. Above all, we are “making listening”, as much as we are “making sound”, as we seek to enhance our capacity to perceive subtle tonalities – even if we do not fully understand them – as we tour Taiwan together. Most Western languages, including English, are atonal. This is not to say that English does not have tones – schematics for different emphases of pitch – but rather that, in English, tonality is not a defining characteristic of the pronunciation of each word. Spoken Chinese, on the other hand, cannot not be tonal (or, be monotonal), since the pronunciation of each syllable is fundamental to the production of meaning when the language is spoken. The ‘entering tone’ is one of the four major tones of spoken Chinese dialects. Having disappeared from mainland Mandarin, it is one of the distinctive markers of the Taiwanese language. Not a phonetic tone in the sense of pitch relationships, the entering tone denotes a syllable that ends with a glottal stop, the occlusion of airflow in the vocal tract. To English-speaking mouths and English-hearing ears, the entering tone’s plosive stop is, generally, so unfamiliar and so rare as to be eventful; perhaps this is even coded into the mock-gulp of its widely used example of the glottal stop in the English usage, the foreboding exclamation, ‘uh-oh’. We choose to title our tour Entering Tone because it offers us a way of thinking not about sound, but with sound. For what we are hearing, in the rapid, controlled closure of the throat that produces this tone, is the sound of the sudden shutting off of sound. The throat closes, but the entering tone opens a space where shifting meanings are embedded in a sound. It is a sonic object that is also a critical absence. With its multiple identity as political actor, strange interjector and silent presenter, the entering tone for us represents a small but vibrant space for engaged listening. This is Liquid Architecture’s second visit to Taiwan. Our first, in 2016, was a vastly informative research trip. In the course of that visit, meeting artists, musicians, curators and organisers in Taipei, Tainan and Taichung, we learned much – and also learned how little we knew. Through that experience, ongoing conversations, dialogue, and research, and by placing our own assumptions and actions under examination, we have come to view our own position with greater circumspection. The occasion of this major international tour provides us with both cause and opportunity to reflect on the deeper context for our artistic activities, and question the structures within which we, as curators and artists, are positioned and which frame – which is not to say determine – our motivations and actions. For example, on our first trip to Taiwan, we were initially slightly taken aback by hearing ourselves described as Westerners. The reason for our surprise, we came to realise, is that discourses of ‘East’ and ‘West’ are rarely heard today in Australia, by radicals, at least (unlike another term we heard a lot in Taiwan, ‘‘foreigner’, which is more commonly used in Australia). The differences in usage gave us cause for reflection. Might this be due to the historic centrality of these terms in the historic measurement of relative proximity – or otherwise – to the ‘centre’ of Western Europe, and the continued necessity of the project of repudiating the legitimacy of this imperial dynamic and its legacy in Australia’s history of violent settler colonialism? Our expanded capacity to grasp and appreciate the ongoing relevance of the designation ‘Western’ for us, as Australians, coming to Taiwan, stems from our experiences in Taiwan in 2016. From our dialogue with Taiwanese artists and thinkers that flowed from that first contact, particularly the conversations with Hong-Kai Wang, we came to understand something of the significance and currency of this designation for non-Westerners, and appreciate the impact its foregrounding in the discourses of de-imperialisation and subaltern studies. To counter complacency about the East-West relationship, a certain openness of attitude is required. We realise that a preparedness to acknowledge and revise long-held preconceptions, to allow ourselves to be genuinely changed by our experiences with non-Western people – in short, a willingness to listen and to learn – must continue to accompany us on tour, as it did during the research trip. This is the first international tour organised and generated by Liquid Architecture. The considerable privilege of being an experimental organisation able to tour multiple artists internationally comes with the responsibility to recognise that privilege, and a duty, in exercising it, to explore and identify practical alternatives to the well-worked formulae generated by neoliberal agendas globally, as they ‘trickle down’ to forms of cultural expression. The international tour – that mainstay of experimental and conventional music practice alike – is, as a form, not unproblematic. What is normally foreclosed by the act of touring? What else might a tour, as a concatenation of events planned and unplanned, allow? In its usual form – a string of appearances separated and defined by time and geography – the tour is a series of fleeting engagements. The logistics of scheduling dictate a tight window for engagement with each city, often limited to the recruitment of local support acts. Furthermore, the tour itself is based on a presupposition that the work is inherently worth listening to, a presumption which serves to compound the colonialist echoes which would inhere in any incoming venture consisting of a one-way, top-down dispatch of predominantly white – Western – culture. The consideration we have given these matters has helped give shape to Liquid Architecture’s 2017 tour. To mitigate the insubstantiality of the tour form, and attempt to generate opportunities for social solidarity with communities in Taiwan, the tour proceeds from two strategies devised to embed our practice locally. The first is the extension of the tour format to encompass a social program between our artists and Taiwanese counterparts which precedes our formal tour, and whose aim is to establish conditions conducive to mutual discovery and respectful collaboration. The second is the equal importance given to discursive, critical and pedagogical activities as to live performances throughout the Entering Tone artistic program. These activities include the Symposium at the Taiwan National Museum of Art (November 24); the Social Sound Houses in Tainan (November 26) and Taipei (November 29); and the Political Listening talk in Taipei, which together offer a kind of alternative curricula, in the form of the affective pedagogy of workshops, talks, and sharing social space. From formal discursive platforms to free-wheeling interventions, these events are aimed at the possibility of constructing social solidarity via exchange and collective listening. We have attempted to collaborate on every aspect of this tour, from the fluid and dynamic collaborative decision-making process of the co-curation of the artistic program for each event, to establishing flows of discussion between artists, to the program catalogue you are holding in your hands right now (or, post-facto, reading online). Our idea of active listening has necessitated, wherever and however possible, the amplification of Taiwanese voices, in the language of their choice. We haven’t been able to get beyond or resolve the issues of the tour format as a string of brief interactions predicated on too-short, resource-limited engagements – and we were not, in fact, able to collaborate on everything. The Australian artists, for logistical reasons, were curated long ago, leaving little room for Taiwanese input on our choice of cohort. We chose our artists carefully to reflect the depth, heterogeneity and talent of Australian contemporary sound art practice – but in so doing, we did forfeit the chance for full co-authorship, which remains a hoped-for possibility for the future. What we have done instead, we hope, is bring together what we believe to be a the most vital curated cross-section of contemporary Australian sound and listening practice. Andrew McLellan, Clare Cooper, Jannah Quill, Nathan Gray and Rainbow Chan represent some of the most interesting critical artists working in sound in Australia today, and their multiple talents enable us to collectively create the richest possible conditions for dialogue and listening into which to invite the Taiwanese audience. Liquid Architecture’s interest in Taiwan was sparked, in part, by an article we encountered, in 2013, about Hong-Kai Wang’s critical listening practice. We invited Hong-Kai to Australia in 2014, where the residency she undertook underscored for us the importance of being together in the space of cultural production. Our continued dialogue and friendship with Hong-Kai led to her generous facilitation of our research in Taipei in 2016, and we are grateful for the many connections, and many more rigorous conversations provided so generously by Hong-Kai, and honoured by Hong-Kai’s acceptance of our offer to open our Practising Sound, Individually and Collectively Symposium. We were impressed by our 2016 encounter with the depth of Amy Cheng and Jeph Lo’s research and curatorial intelligence, and are honoured that Jeph will present some of his ideas in his keynote lecture at the Symposium. We are grateful to Acid House and Lacking Sound, artist-run collectives from whom we learned in 2016 about the questions and practices they pursue as agents of critical sound and listening, and with whom in 2017 we are experimenting with the creation of collective social space. And we formally begin our tour in the city of Tainan, where our partner Ting Shuo Hear Say, Alice Hui-Sheng Chang and Nigel Brown, instrumental in facilitating this and our previous visit, have enabled us to open our program with an offering of communion and collective ritual. Finally, that article about Hong-Kai Wang, by our good friend Mattin, that first sparked our interest in working with artists from Taiwan, was published in White Fungus, and so it feels somewhat fitting that White Fungus are our co-producers of this publication and the SUBLATE event (2-3 December), the grand finale of the ENTERING TONE tour. That essay, and Ron Hanson’s article about the Taiwanese sound scene in that same edition (WF13), enlarged our curiosity to the point of wondering whether a Taiwanese tour might, in fact, be possible. It is a pleasure to collaborate with a publication that has provided so much knowledge and enjoyment to us and readers interested in experimental music and art the world over. We are grateful to Ron and Mark Hanson for extending the characteristic WF openness, energy, insight and vision into the realisation of this collaboration with us. We are excited about the discursive and performance activities we have planned for ENTERING TONE, and while we don’t know exactly what will transpire across our program of talks, performances and workshops, we can relinquish the need to know, because we know that whatever happens, the awareness we will be generating means we won’t be unchanged.